February means Valentine's Day. Right? Grocery stores are filled with big red hearts filled with candy. What can you do if that's not the right treat for your sweet? Maybe you need something allergen-free. Maybe you want something more natural. Maybe you need a vegan or gluten-free treat. 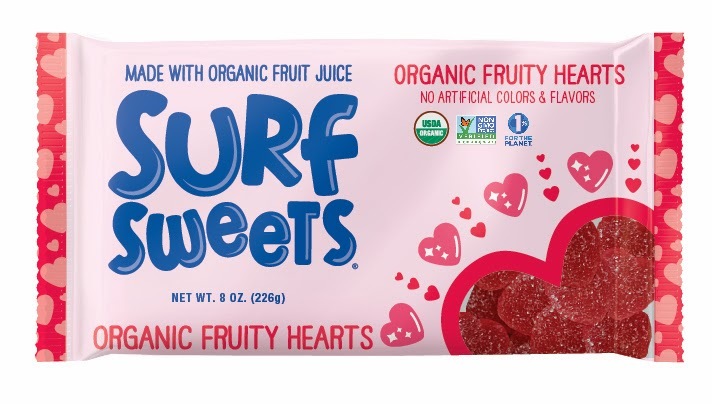 How about Surf Sweets Organic Fruity Hearts? The Surf Sweets company sent me their gummy heart-shaped candies to review. We loved them. They are tangy sweet, chewy, and super cute. We all tried them as an early Valentine's treat yesterday. They were a hit. When I was shopping this weekend, I saw nice size bags of them at Whole Foods. Surf Sweets sent me Organic Fruity Hearts to try and review, but all opinions are my own.